One of the upsides of having to leave unexpectedly for a long period of time is that, culinary speaking, and as you have to empty the fridge as fast as humanly possible, it can get your creative juices flowing. Or at least, it can make you to do things you intended on doing but didn’t dare doing or never got around to doing until then. This is what happened to me late last week, when it was decided that I would be leaving for Greece within a few days. I had some whipping cream and some sweet pastry lying in the fridge, and some guests coming over for a last-minute dinner. So I figured I would throw together one of my favourite desserts which, oddly enough, I had never made so far: chocolate tartlets. These are really quite simple to do, as I really used just 4 ingredients: sweet pastry, whipping cream, chocolate chips and a pinch of salt. Obviously, you can make your own pastry and add any flavouring you’d like to the tart (liqueurs, extracts, spices, chopped nuts, etc…). Using a cookie-cutter, drinking glass or baking tins, cut 4 circles into your dough, slightly bigger than your tins. Butter and line your tins with baking paper if needed, and gently press the dough into each tin, being careful not to tear it. 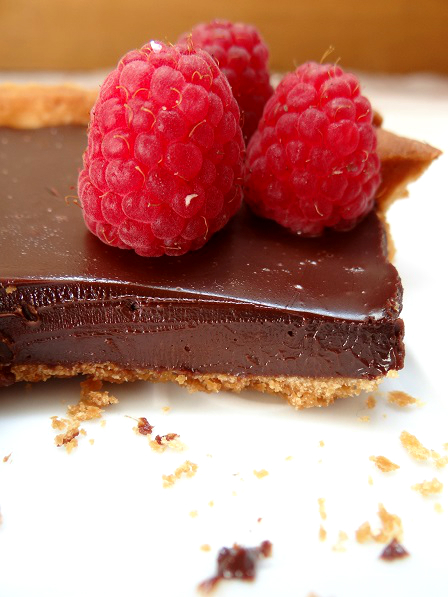 Prick the bottom of your tarts with a fork, or use baking beans to prevent the dough from rising. Blind bake for about 15-20 minutes, or until your pastry is golden brown. Remove from the oven, remove from the tins and allow to cool while you prepare your ganache. Add the chocolate chips to a medium bowl. In a small pan, heat your cream with the spices, if using. When it starts bubbling, pour the hot cream over the chocolate chips. Let stand for a minute before carefully mixing with a spoon or spatula. Add the salt and other flavourings, if using, mix well and allow to cool completely. 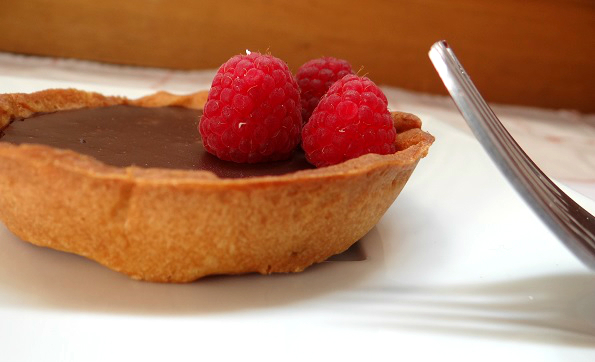 Pour the cooled ganache into your pastry shells and let set in the fridge for at least a couple of hours. Decorate with fresh fruits, dusted icing sugar, candy, nuts… let your imagination run free. I might try with white chocolate as I m not very found of black one. White chocolate and berries blend well. Thinking of adding almond powder in the dough.